I say this every year, but seriously, where did this year go?! 2010 has flown by faster than any other year of my life. But I can honestly say, this has been the most incredible (and life changing) year of my life. January, I had my maternity photo shoot. Josh and I ventured down to South Carolina for a visit with his dad. We took beautiful beach pictures on Sullivan's Island. I was 30 weeks pregnant and anxiously awaiting the arrival of Julianna! 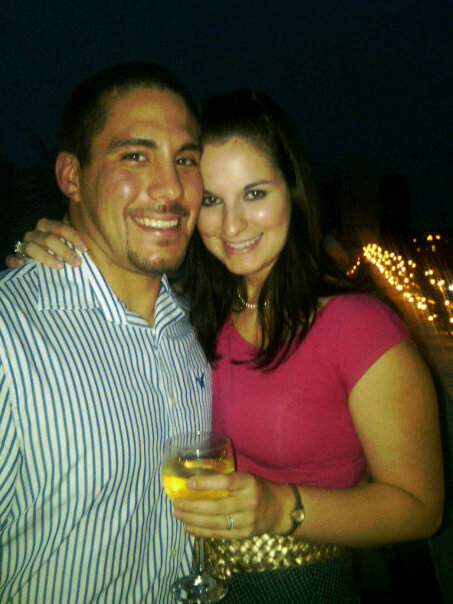 February, we celebrated our Valentine's Day. Josh and I only spent $10 on each other and came up with some sweet, creative gifts. We also took our baby class to get us "ready" for bundle of joy. 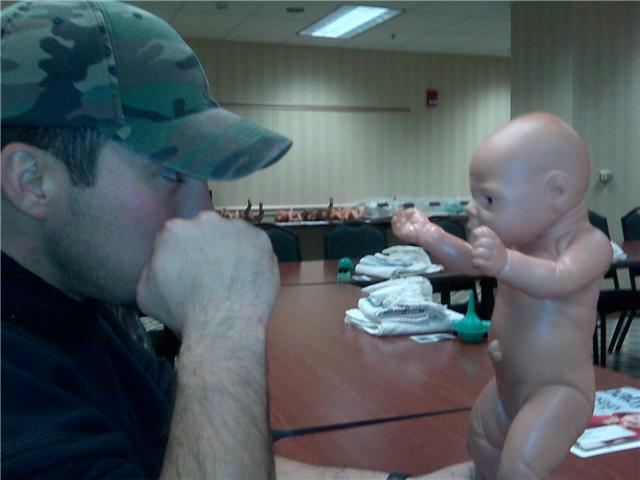 The class turned out to be full of laughs and a bonding experience for Josh and I. I also had one of my baby showers at the end of February. 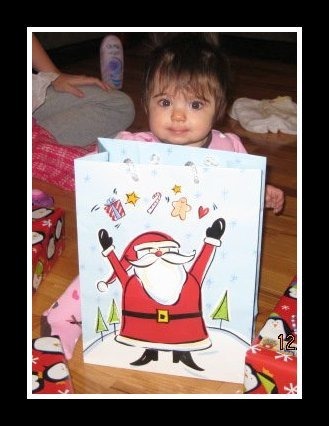 I was so blessed by all of the amazing gifts... Julianna was already so loved before she was even here! April, we celebrated our first Easter with our tiny, newborn. Having a newborn was quite the experience... no sleep but lots of smiles. I spent so much time just holding and staring at my beautiful baby girl. During this month, Josh also had to leave us for a week to go to Denver. It was so hard on Josh and on me. He missed us and we definitely missed him! He's such a good daddy! May, Julianna took her first bubble bath. We even made her a bubble bikini! Just the beginning of all of the fun firsts we will have with our precious daughter. Julianna also went on her first road trip. We traveled about 4 hours to South Carolina to visit Josh's dad. 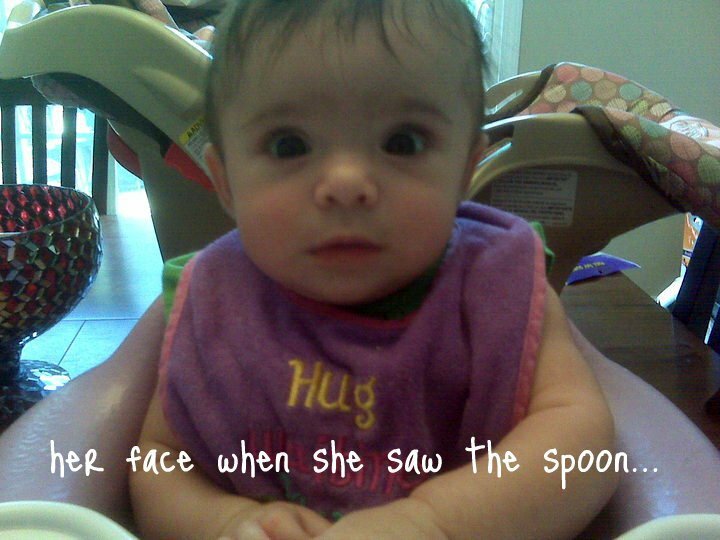 Julianna had been there before; just not outside of mommy's tummy. I also celebrated my first Mother's Day. Sometimes it's still crazy to think that I'm a mom, but it's the most amazing job ever! June, Julianna went to her first baseball game. She went to see the Copperhead's play at McCrary Park. She slept most of the time while Josh and I chatted with our friends. 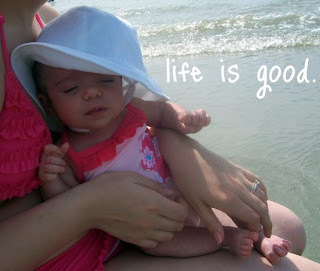 Julianna also went on her first beach trip. We went with Josh's family and rented a huge condo at the beach. Josh and I also celebrated our 2nd wedding anniversary. I'm so happy to be married to my best friend! July, we celebrated Josh's birthday and the fourth of July back in South Carolina at his dad's house. 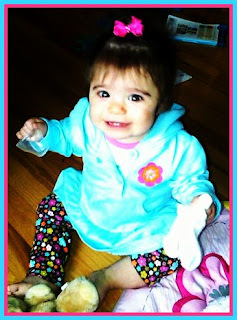 Julianna also tried cereal and baby food for the first time this month. 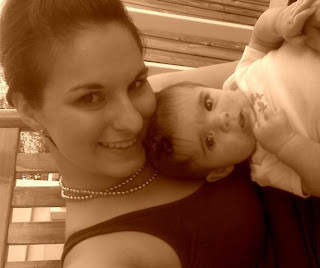 August, the month when I had to return to work after being on a very extended maternity leave with Julianna. 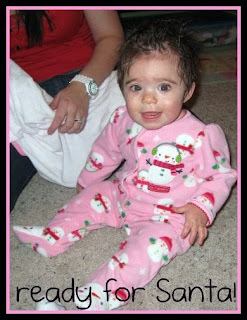 I was so amazingly blessed to have been able to stay at home with her for the first 5 months of her life. It was so hard going back to work but I really enjoyed the interaction with "big" people again. She began daycare at Randleman Enrichment Center. We also got our new car this month, a 2010 Honda Accord. I love this car! September, such a busy month for me. Getting back into the swing of things at school and just learning to balance it all was tough. It still is tough. But I have an amazing husband and family that help me make it happen. 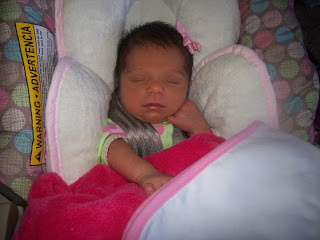 Julianna had her first overnight stay at her Maw Maw's while Josh and I attended the wedding of 2 of my college friends. We also made another trip down to South Carolina to celebrate Ashley's birthday and visit Josh's dad. Little peanut also turned 6 months old this month! October, Julianna got her very first tooth... which caused for two all nighters two nights in a row. Cutting teeth is rough! 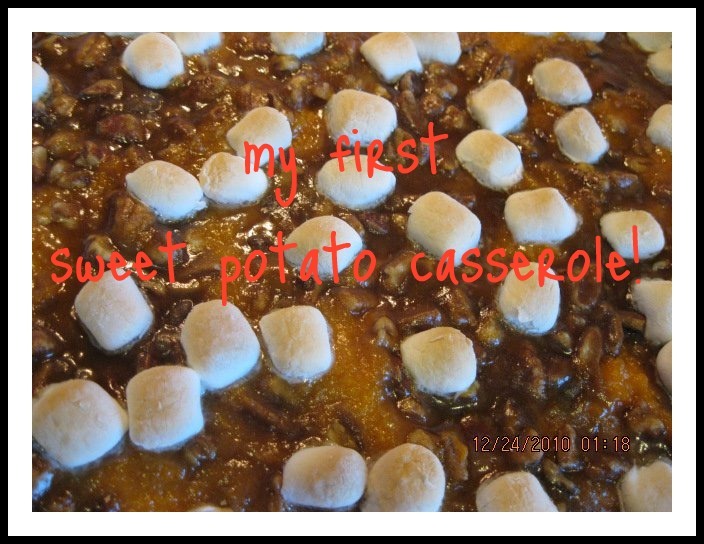 She also went to her very first Asheboro Fall Festival and Nascar Days in Randleman. Josh dressed up as the "Fat Cat" at Nascar Days. I think Julianna will be very proud one day! 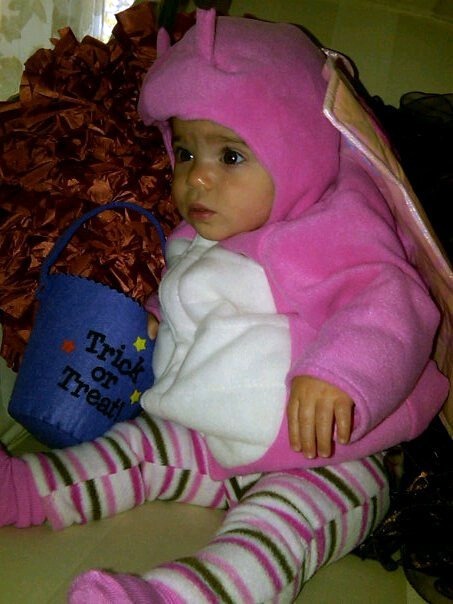 JuJu Bug celebrated her very first Halloween, dressed as a beautiful butterfly! She didn't do any trick or treating this year but she did visit Nana, Paw Paw, cousins Tyson and Ashton, uncle Zach, and aunt Katie. We'll go trick or treating next year... if Josh isn't too busy scaring children at our house! November, Julianna's first Thanksgiving and our first time having family over at our house. Josh's family came over to our house for Thanksgiving lunch then we headed to my brother's mother in law's house for Thanksgiving dinner. We were stuffed and Julianna was worn out but it was a great day. The next day, we went to South Carolina to visit Josh's dad for the weekend. Our Christmas tree went up before Thanksgiving this year! 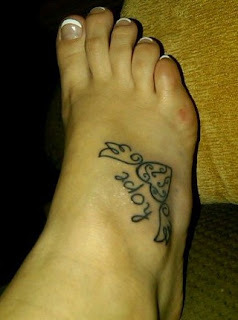 I also celebrated my 25th birthday this month and got my newest tattoo on my foot! December, the final month of an amazing year. 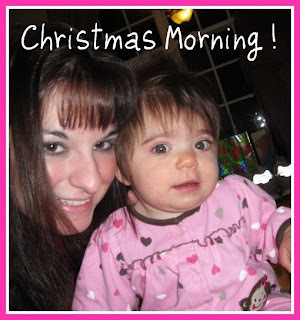 Julianna experience her very first snow and her very first Christmas. Josh and I also hosted my family's Christmas Eve celebration at our house. 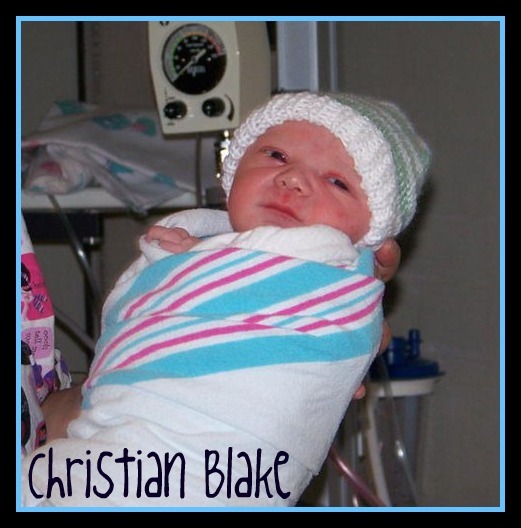 Our new nephew, Christian Blake was also born. 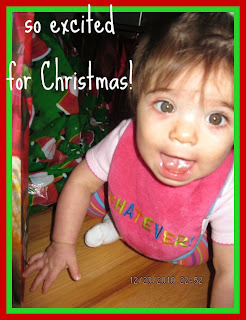 And today, Julianna started crawling! We are so blessed! And looking ahead, I'm already anticipating another wonderful year. We have so much to look forward to. Before I know my sweet little girl will be walking and running around this house! 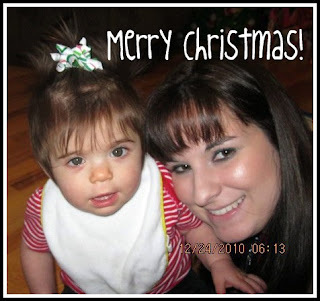 In 2010, everything was centered around Julianna. She is our world! She has brought happiness, laughter, exhaustion, confusion, silliness, but most of all, she has brought us LOVE. To sum up 2010, I'd say it was a year of LOVE! My brother's daughter is turning one today! It doesn't seem like a year has passed by since little Clara was born. She's such a sweet little girl! 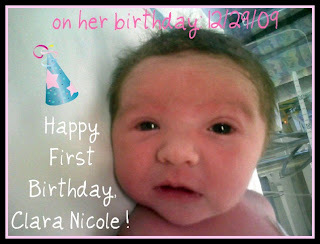 Happy First Birthday, Clara Nicole! Julianna is 37 weeks old which means that she's been out of my tummy as long as she was in it. 37 weeks ago, I was so thrilled to be a mom. 37 weeks ago, I had no idea how hard or how fun it was going to be. While you're pregnant, you really don't have any clue (unless you've had a child before) what all is really involved in giving birth to and raising a baby. I'll fully admit that I was clueless! 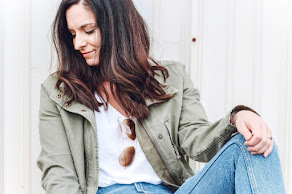 I really thought I knew while I was pregnant, but I didn't. When people tell you that you're life is going to change completely, that is the honest truth. My life is completely different. Every little thing about my life has changed for the most part. My daily routines are based on hers... something has simple as a shower must be scheduled in to make sure it happens. Even with the numerous ways my life has changed, I can say that it has changed for the better! Life isn't just about Emily anymore, or even Emily and Josh--it's about us: a family of three. Julianna is 9 months, 1 week, and 4 days old today. I had Julianna when I was 9 months, 1 week, and 4 days pregnant. I had so much left to do in preparation for her birth. Honestly, I don't think I would have ever been truly "ready" for it to happen. God had a plan and it was my job to follow it. She's here now, 37 weeks and 4 days later: happy, healthy, and growing like crazy! Just in the past few days, she's learned how to not get "stuck" in a position. She can go from back, to belly, to sitting in about 3 seconds. She's so proud of this... she does it over and over to show mommy. She's still trying so hard to pull up on her own but hasn't quite gotten it yet. She can open drawers now which make me realize that I need to get this house baby proofed (or as much as possible) asap. She also says her own version of dog which is a "duu". We sat in front of the dog kennels tonight and she kept saying duu, duu, duu. She loves dogs! Our house has also changed. It's a baby zone for sure... everywhere! Here I am 37 weeks pregnant... the night before I had Julianna. 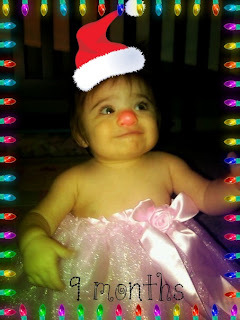 Julianna had a great first Christmas... even despite coming down with another cold. Poor thing woke up Friday morning all snotty. She still managed to have fun! 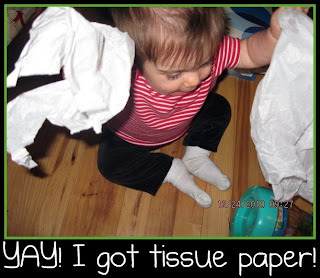 She played with her cousins, punched holes in presents, and tore up tissue paper! She got tons of awesome gifts from her aunts, uncles, and grandparents. We had Christmas Eve at our house with my side of the family and Christmas Day at Josh's brother's house. There we got to meet the newest member of the family, little baby Christian! Josh and I really enjoying having our little princess here for Christmas this year and we are looking forward to next year already! 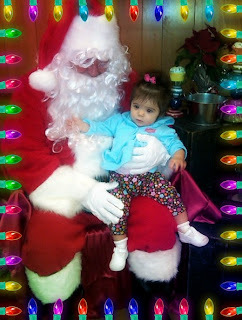 Josh and I took Julianna to meet Santa Claus for the very first time today! We had wanted to take her to a place where we could take our own pictures. I saw posted on Facebook today that Cupcakes to Go Bakery in Randleman was going to have Santa and Mrs. Claus there. Julianna didn't cry at all but she was a bit puzzled about what was going on. 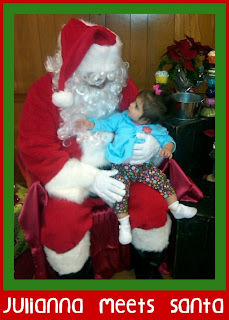 She wouldn't smile because she was just trying to figure out why she was sitting on a strange person's lap. 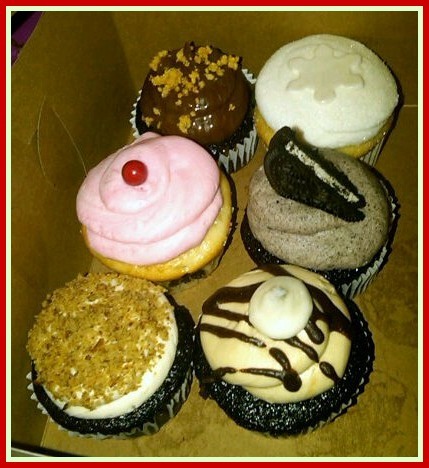 After a quick visit with Santa, we picked up a half dozen of delicious cupcakes. 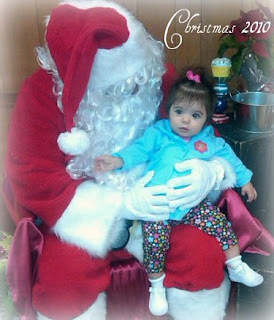 Overall, it was a very successful first visit was Santa... and mom and dad left with cupcakes! Julianna has discovered her voice even futher today. She is squealing and screaming at the top of her lungs! 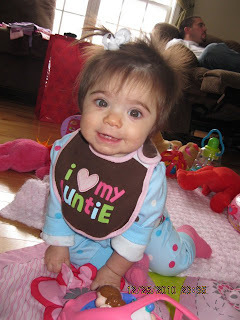 Her "little diva" bib was totally appropriate this morning! Today you are 9 months old. 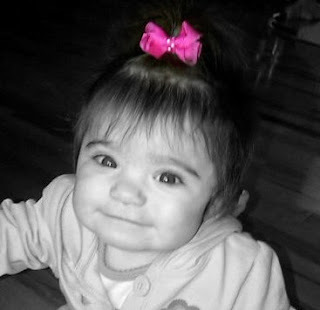 It's been 9 months since you graced this world with your amazing presence. You have changed so much in the past 9 months. 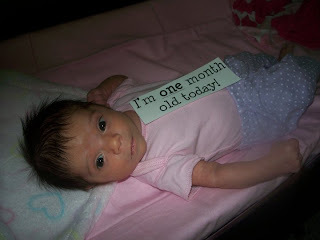 For one, you have way more hair today than you did when you were born. You had hair when you were born but not the crazy, outta control hair that you have today. When we are walking through any store or anywhere really, people always comment on how they love your hair. I love it too. It makes you so unique. You can definitely pull off the standing straight up, bed head look. You're beautiful! You loved to be told you're pretty. You know it's a good thing. Someone told you that you were pretty today and you started to clap. Besides your looks, you are developing quite the personality! You are learning to throw your own little temper tantrums when you don't get what you want (such as when mommy won't you type on the laptop). You also have become quite the little talker. You can say dada, mama, mom mom, nana, baba, and just this week you have started to say vaooo....which I'm going to intrepret as "I Love You" since your mommy and and daddy tell you that nonstop! You are also becoming more mobile. You won't crawl, but you'll scoot to where you need to go. You try to pull up on your own but you haven't been very successful. This morning I found you trying to pull up in your crib. You'll get it, keep trying! One of my most favorite things right now is that you have been sleeping through the night for about 3 weeks now. Even though I enjoyed our 3am bonding time, I'd much rather bond with you when I'm fully awake and alert. Thanks for thinking of me and sleeping til at least 6. You're awesome! I have enjoyed being your mommy this past 9 months. It hasn't always been easy but I have genuinely loved every minute of it. These past 9 months have flown by and I can't wait to see what's in store for the next 9. You are my whole world, you mean so much to me, and I love you with all of my heart. I am so proud to call you my baby girl! 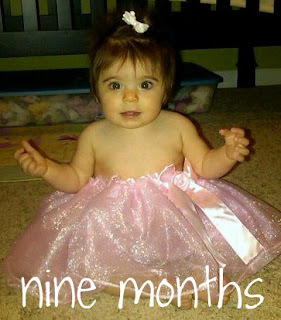 Happy 9 Months, Julianna Hope! My sweet baby girl just can't get a break. She has pink eye now! We have taken her to the doctor three out of the past six days. The doctor said it was just beginning so thankfully we've caught it and are treating it before it gets really bad. They also weighed her again today. On Monday, she weight 17 lbs. 14 oz. Today she was 18 lbs. 2 oz! 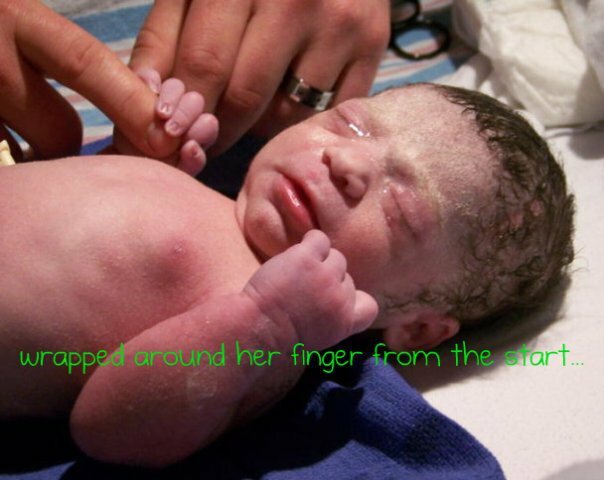 She gained 4 oz. in 2 days. What a piggy! She has actually been in a great mood since I picked her up from daycare. 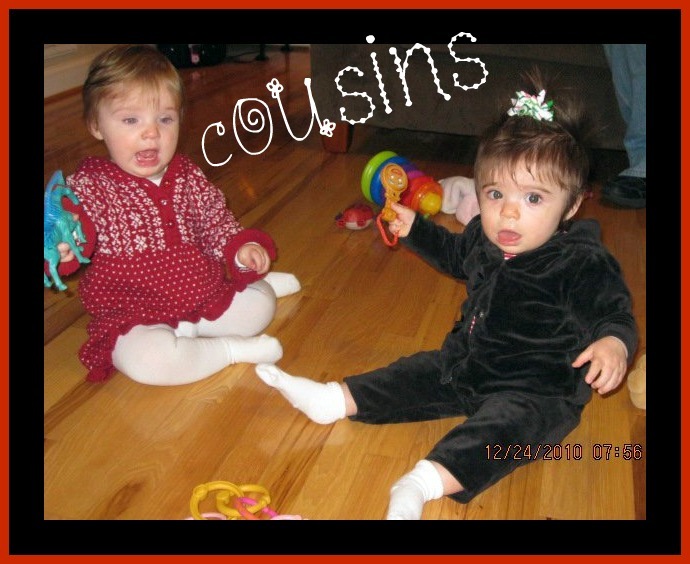 Super playful, giggly, and talking to everything and everyone. She's even trying dance now. Too cute! I love my little girl so much! Julianna a few days ago when she tried her princess tutu on for the first time. I bought this tutu for her the day I found out that I was carrying a little girl in my tummy. Her first teddy has been wearing it for her since then. It fits her great now! The main thing I want for Christmas is a healthy family! Josh, Julianna, and I have all been sick in the past month. Little Julianna had a chest infection and had to do breathing treatments as well as take an antibiotic. The doctor said if she's not back 100% by Monday, bring her back. I told daycare this morning that if she's not feeling well to call me without hesitation. This afternoon, daycare called me and said she had been fussy, irritable, and just cranky all day long as well as pulling at her ears. As soon as I could leave work, I got her and took her to the doctor. I was praying it wasn't an ear infection or that she hadn't gotten worse--even though she seemed so much better this morning. Julianna's doctor said she was completely healthy! She said her pulling at ears could be from the pressure from some congestion that she still has. 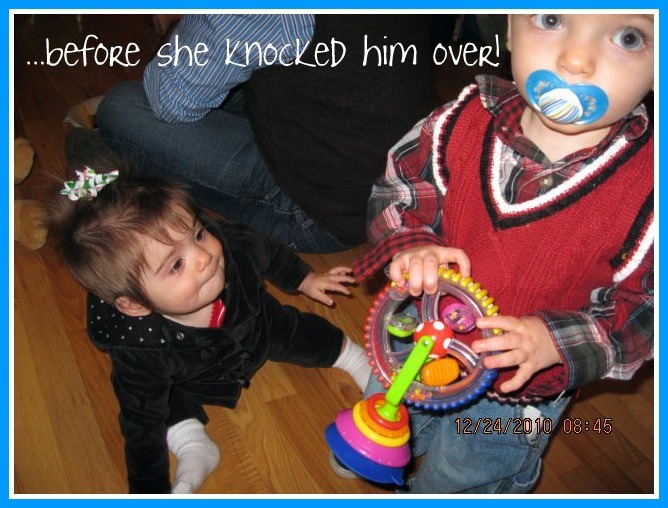 She blamed the crankiness on teething. JuJu has several spots on her gums that are showing signs of new chompers on the way. My 5 pound baby has turned into my almost 18 pound baby! She weighed in at 17 lbs. 14 oz. today! She has definitely come a long way since March 17. I cannot believe she'll be 9 months old this week. She's been out in the world almost as long as she was in my tummy. she's not a paci baby. 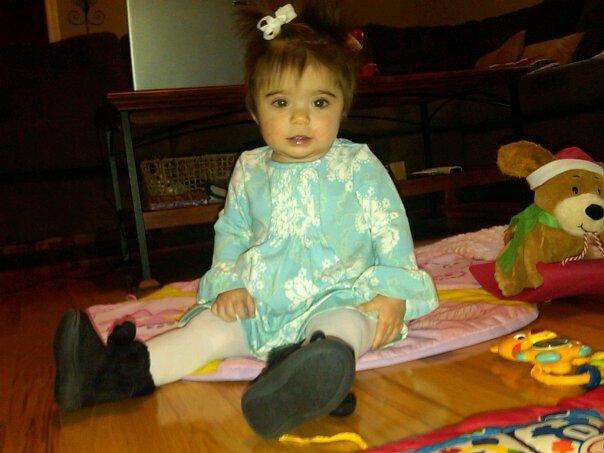 Julianna has started to make this crazy face everytime she's not getting her way. 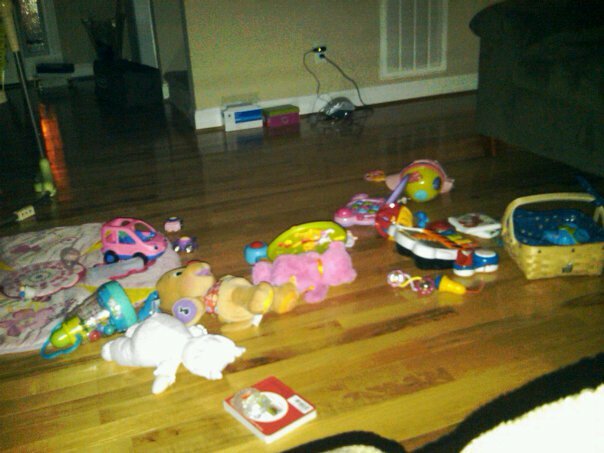 I wasn't aware that temper tantrums started at 8 months old! We've got an exciting road ahead of us!